The early E21 Alpinas (model designation A-) had Alpina 02-series based 4 cylinder engines ranging from 125 to 160 BHP. After BMW fitted six cylinder engines Alpina was soon to follow. But not the new 2.3 litre engine of the 323i stood model for the first six cylinder Alpina E21, but the 2.8 litre engine of the 528i. The E12 powerplant fitted only just, the battery was placed in the boot, also to distribute weight better. The modifications to the engine included modified combustion chambers, a higher compression ratio, the Solex Pierburg Zenith DL fuel injection unit, different camshaft and a revolutionary rotor-less digital electronic Dr Hartig ignition unit. In 1981 the 2.8 litre unit was upgraded with the more reliable Bosch L-Jetronic fuel injection and power rose from 200 to 218 BHP. 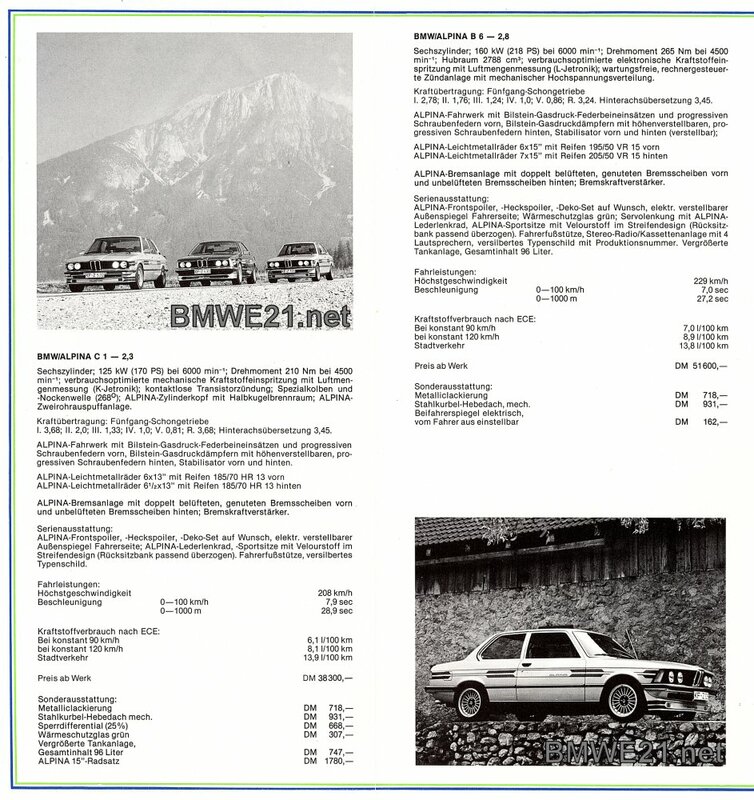 In 1980 Alpina introduced the C1 2.3 to close the gap between the 323i and the B6 2.8. This engine was based on the 2.3 litre unit. Modifications made were the same as to the B6 2.8 engine except for the ignition and the fuel injection unit. The C1 2.3 kept the 323i K-Jectronic fuel injection system of the factory 323i and produced 170 BHP. The changes made on all Alpinas to suspension, diff and related parts made the car much more stable, predictable and easier to handle. Tests with the B6 2.8 only contain superlatives. Even for nowaday standards this is a fast car! The interior of the Alpinas is completely rearranged. Recaro sports seats with Alpina cloth, a leather sports steering wheel, an Alpina gear knob and an Alpina speedometer are the most eyecatching changes. Link to The Unofficial Alpina Site a very useful resource!